Numerous challenges exist when designing plastic packaging or extrusion for industrial or consumer product applications. Our ANSYS-based solutions enable you to virtual prototype both your design and your selected manufacturing processes. Material costs have to be minimized. Even saving a tenth of a percent per package can lead to large raw material costs savings. The packaging must be structurally sound and resist different structural constraints such as stacking-up during transport, quizzing of the packages by consumers and dropping accidents. The filling process must be optimal to minimise both filling time and the amount of gas captured. Dispensing the liquid must be a positive experience for the customers— the right amount of squeezing for the right amount of product dispensed. Through our Design Simulation and Advanced Manufacturing experience and expertise, we provide a complete multiphysics capability to cover all aspects of packaging design, including blow moulding, thermoforming and extrusion polymer processes. ANSYS Polyflow allows engineers to optimise material distribution — to ensure the absence of weak spots — by simulating the manufacturing process. Design geometry (including local material thicknesses) can easily be transferred for structural analysis within ANSYS Mechanical to ensure that the product will withstand normal stress and strain. 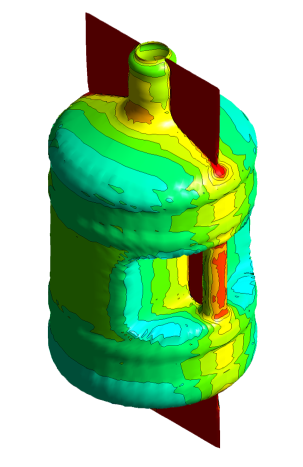 Design geometry can also be assessed using ANSYS CFD to predict the behavior of the container and liquid, including liquid filling and dispensing simulations. ‘What-if’ and optimisation studies can be undertaken using a parametised model.